Off from Chengdu! 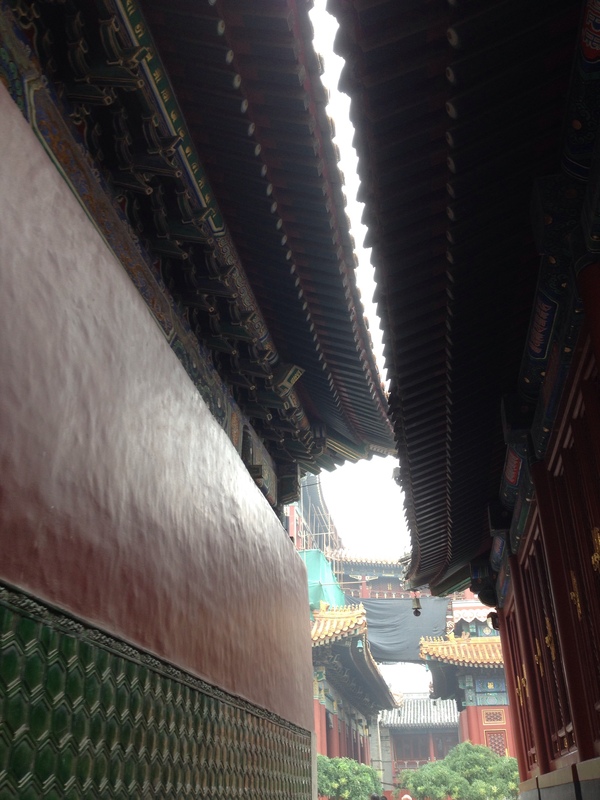 Zaijian, Sichuan Province – hello Beijing! Landing in Beijing, I’m reminded of my first impression of China – the smoggy cloud covering the ground greets me, and I regret my loss of facemask. The second thing to hit me is the heat – it’s hot and humid, in oppressive waves that get me sweating almost before I reach my luggage. I meet my tour contact, who in this case I will call Ted, who drives me to the hotel my Dad booked. It’s ritzier than any place I have stayed at to date, save for the Marriott Champs-Elysee (again, not my booking) – the JW Marriott Beijing. There is a fleet of attendants to take my bags, guide me to check-in, and generally ensure that I don’t feel any anxiety about being abroad in a foreign country. Enjoying feeling posh, I don’t tell them I’ve been in their country for four months, and allow myself to be pampered all the way up to my comfortable room. There’s a dragon fruit in the fruit bowl, and chocolate dim sum. The Marriott in Beijing smells exactly like the Marriott in Indianapolis – that’s what hits me the strongest. They must use the same shampoo, or the same air filters, or something. That is my first day – travel, checking in, settling on a plan of action for the next day. I turn up the A/C, put on a fluffy robe, and watch HBO in peace. The Lama temple is home to a large Buddha statue that has the distinction of being in the Guinness Book of World Records for being carved from a single giant piece of sandalwood. That sounds promising and familiar. 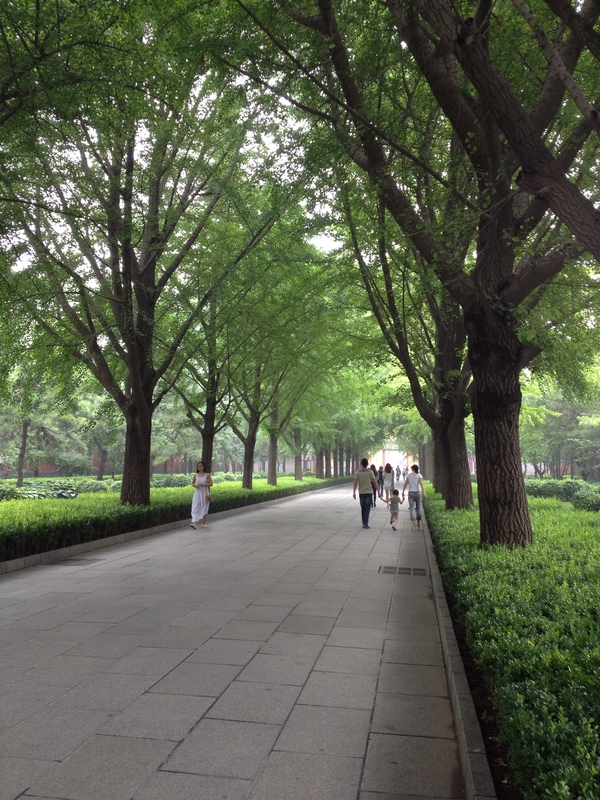 By this point I’ve seen quite a few temples, so when I see the green avenue leading to the gates of the first hall, it’s calming. I recommend visiting this temple. It’s not very large, but it’s full of character. You can feel the history in each of the buildings, and it’s pleasant to watch the monks go about their business, spinning and praying at the prayer wheels at the behest of the practitioners. They also sit in the corners and look at their cell phones – they are not afraid of bringing in modernity to their lives, though it’s done in singular, small things like the phones. And the Buddha – it’s been awhile since I’ve seen something so beautiful. I think the Golden Summit at the peak of Emei mountain was the last time where I was in awe of something. This would be the second. It’s not just the height of the statue, though it is tall. 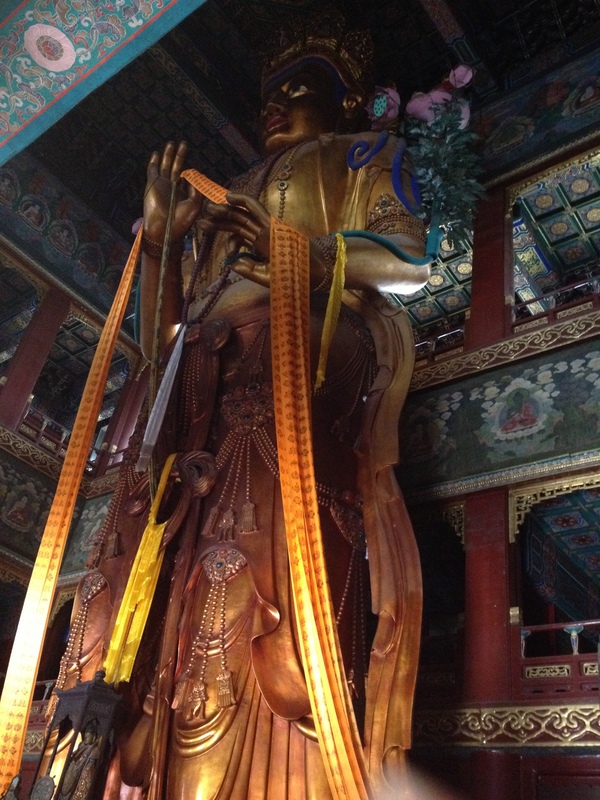 It’s the serene grandeur – Buddha draped in long swaths of yellow fabric, staring at everything around it, but focused on nothing. The air is muffled and full of incense. It’s improbably peaceful in such a hectic city. Up unto seeing this statue I have adhered strictly to the tenants of each Buddhist temple, specifically that you cannot take photos inside the temple. I make up for my indiscretion by putting a larger than normal donation in the temple box. Worth it for a memory worth remembering. 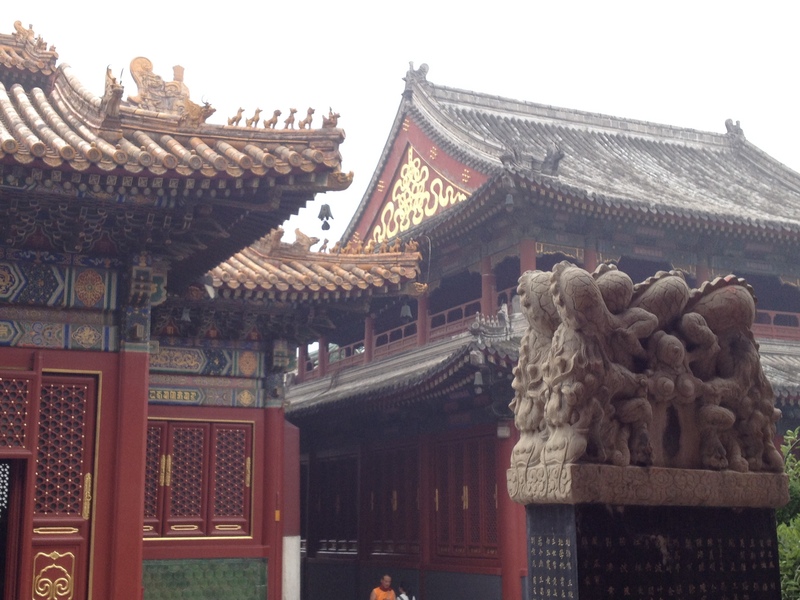 My second stop, just up the street, is the Confucius temple. It’s one of the very few sites in China where people make offerings to a man instead of a deity. I think the best Christian comparison would be how I pray to the Saints to help carry my prayers. 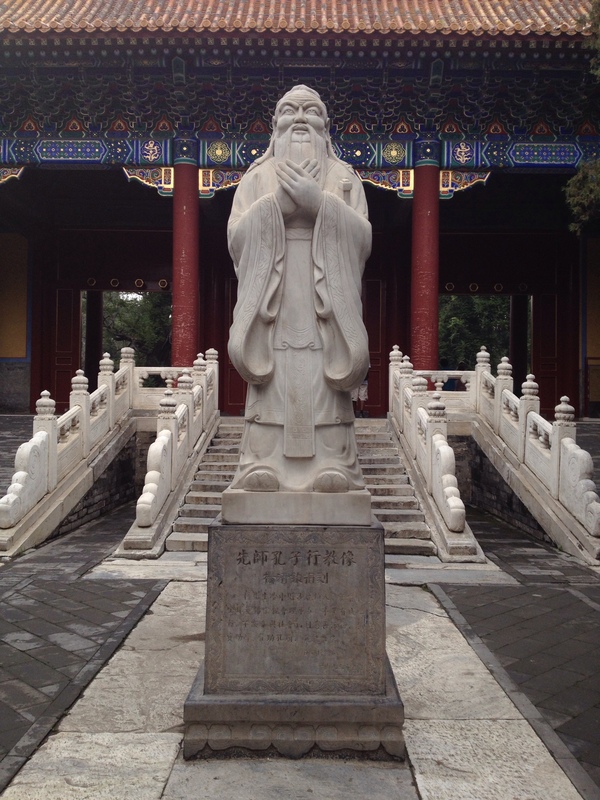 I think that would make Confucius the patron saint of Education, and being generally egalitarian about work. There are very few people at the temple – I don’t think it’s as famous or popular a tourist stop as some of the other places in Beijing. So entering the space, there are two groups ahead of me, walking in schools like fish behind a high-flying flag. I give them space, and wander through the giant steles alone. It’s creepy, how empty it all feels. Stoic huts house dragon turtles, carrying faded stone carvings with names and dates no one reads. I always felt a strange resonance with the dragon turtles here – carrying things forever. Now I feel a little bad for them. A chipmunk goes scurrying around the bases of the huts, looking for food. It’s strange because I know that there are millions of people outside the walls, that the city spreads and spreads and is packed with souls. But there are none here, not in the front of Confucius’ school. The museum is similarly deserted – a single soul wanders reading the plaques. The museum is nothing but sunshine and pro-China quotes, positing Confucius as the progenitor of all education systems in the world. 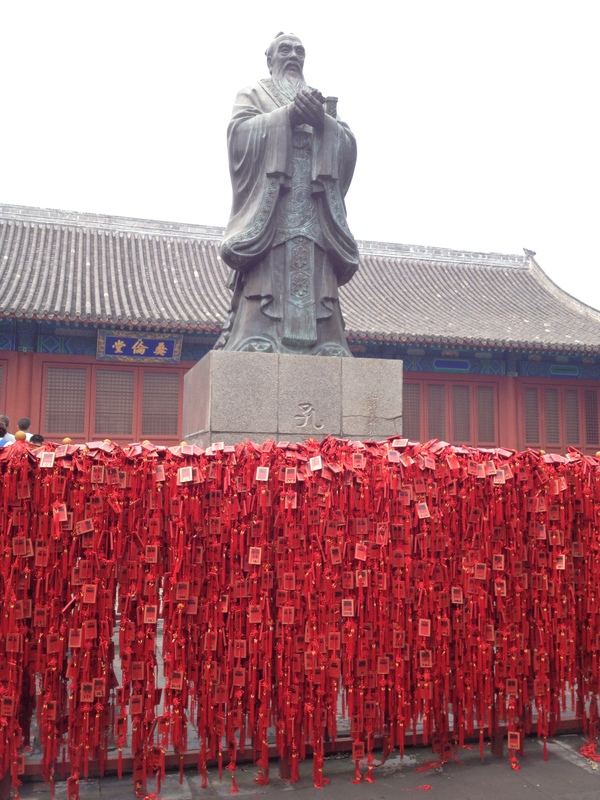 There are more people at the actual tomb of Confucius – his statue is festooned with red tags. Each tag has the name of student and school, or student and graduation year. The tags are prayers to Confucius, hoping he’ll inspire them (or maybe inspire their teachers to be generous). 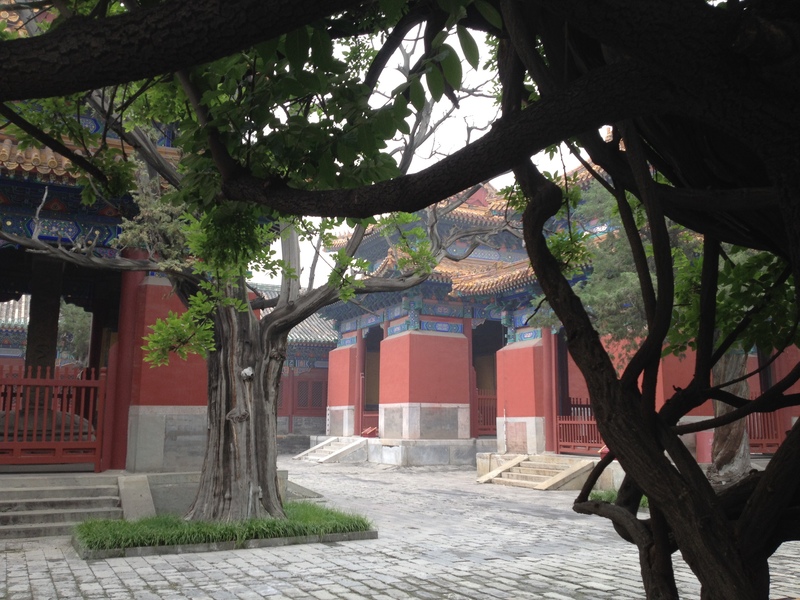 It’s a pretty area, and again I’d say if you are looking for a place that is not as crowded as the Forbidden City, but still has some interesting history, spend an afternoon at the Lama and Confucius temples. Before heading back, I stop at the Silk Market – but that’s another post. Then I meet Ted, and we go to collect my Parent. Now, the “official” tour of Beijing can begin! 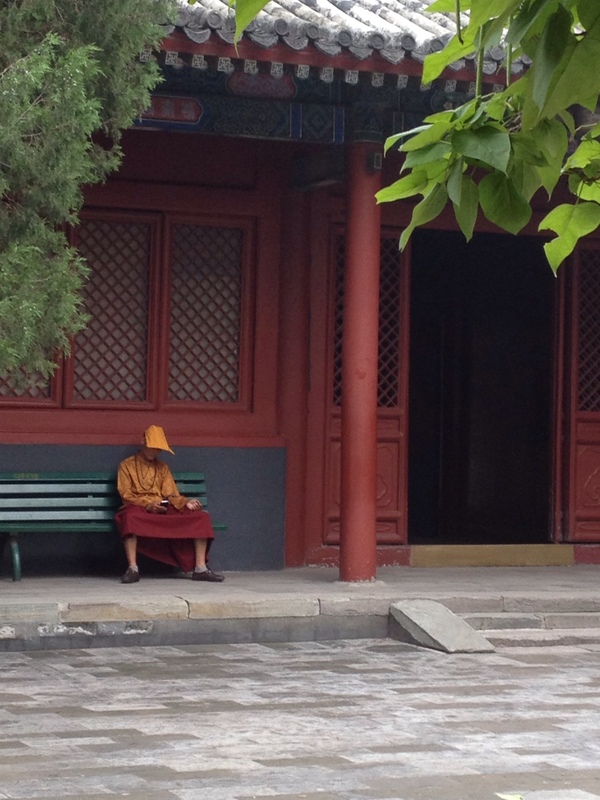 This Post was posted in Places, Travel and tagged Beijing, Buddhist Temples, China, Confucius, living abroad, Tourism, Travel. Bookmark the permalink.